LOWER MANHATTAN — A construction pit near the World Trade Center site is still filled with Hudson River water, one week after a protective wall sprang a leak. The green water first poured into the pit in front of the World Financial Center, just south of Vesey Street, late at night on Nov. 4. The FDNY contained the leak in just a few hours, but the crack in the river wall has taken longer to fix. It is unclear what is causing the delay, but two sources familiar with the situation said crews are holding off on draining the pit until they’ve repaired the crack. 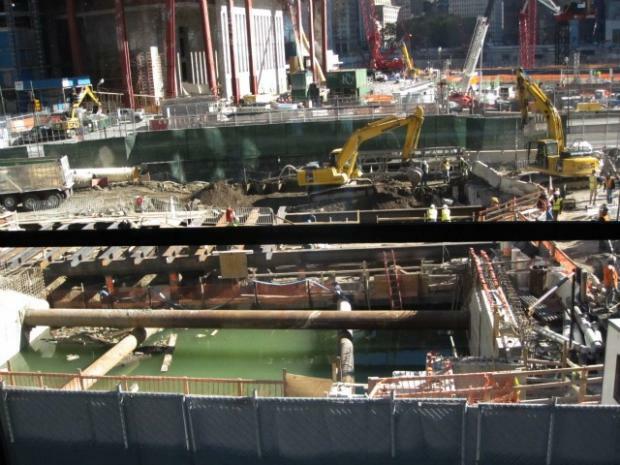 The area that flooded is part of the excavation for the pedestrian tunnel beneath West Street, which will eventually connect the World Financial Center to the World Trade Center site. Brookfield Properties, owner of the World Financial Center, is building the tunnel from the west side and constructed the temporary concrete wall to keep the Hudson River at bay. The flood may have occurred because the grout the workers put in the wall did not fully seal it, said Matthew Cherry, Brookfield spokesman. "The situation remains well under control," Cherry said Thursday when asked about the lingering water. "It’s a minor issue. It won’t delay the long-term timeline of the underpass project." The pedestrian tunnel is scheduled to open by the end of 2012.